Earlier this year we have published a tutorial on how to raise the Power Target limit on GTX 750 – the first Maxwell-based video card. Now it is time to provide an update on how you can raise the maximum power limit of the new Maxwell GPUs – GTX 970 and GTX 980. The thing you need to do and the tools required are pretty much the same, however you need to use more up to date version of nvflash that supports the new cards. Also as compared to GTX 750 where many of the cards do not have additional PCI-E power connectors with GTX 970 and GTX 980 you also need to raise the limits of the PCI-E lines as well in order to allow the card to take advantage of the full increase in TDP you can set. And if you wonder why you would need to raise the power target limit for standard pretty low TDP values set for most GeForce GTX 970 and GTX 980 cards – it is quite simple – more overclock resulting in more performance and higher hashrate. 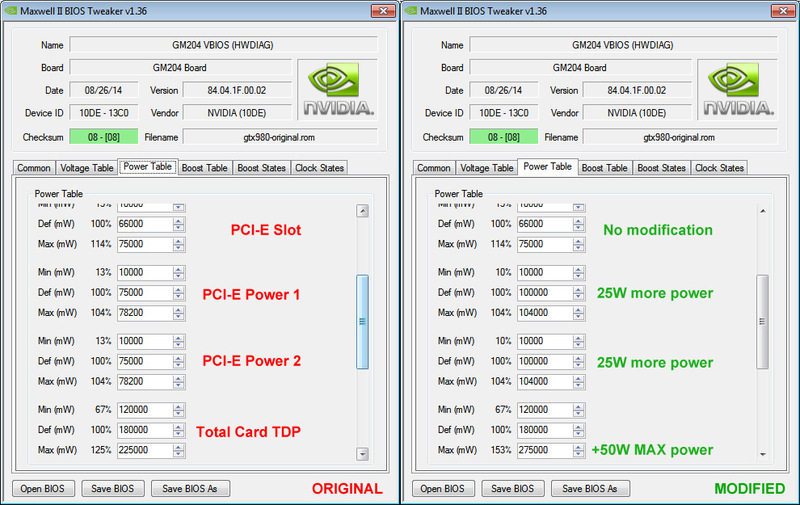 The standard TDP levels set in the video BIOS of the new Maxwell cards are pretty much fine for the default operating frequencies and the default boost frequency, but are not enough to realize the full overclock potential of GTX 970 and GTX 980. 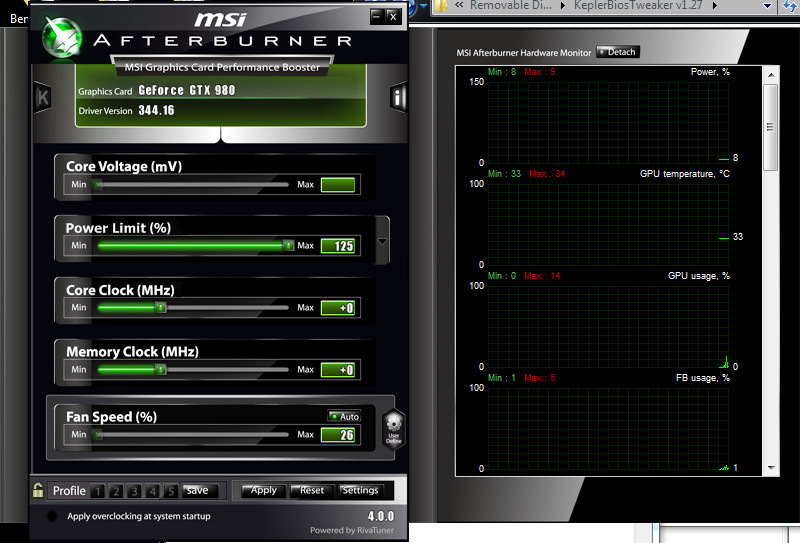 With a little increase in the TDP limits and proper cooling many of the GeForce GTX 970 and GTX 980 based video cards are able to hit and keep a boost frequency for the GPU at about 1500 MHz or even more. Back with GTX 750 we used a tool called Kepler BIOS Tweaker and you can still use it for basic TDP limit modifications for the new cards, but now there is a new version of that tool with official Maxwell support. It is now called Maxwell II BIOS Tweaker and the latest version for the moment is 1.36. If you are already familiar with the Kepler BIOS Tweaker tool, then you should not have any problems using the new tool. 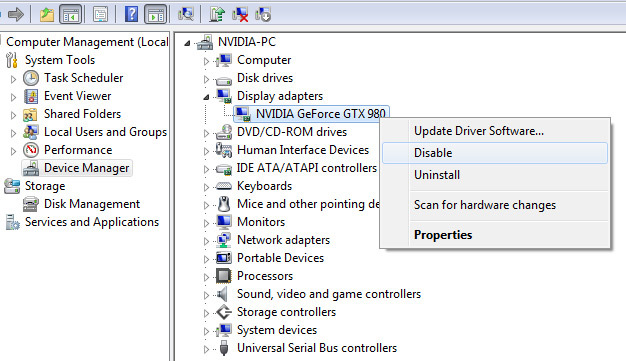 You also need to use a new version of the nvflash tool for saving the original and flashing the modified video BIOS on the video card, we have included the required files in the package below. Alternatively you can also use the latest version 0.8.0 of the tool GPU-Z to save the video BIOS as previous versions had issues when trying to save the BIOS file of GTX 970 and GTX 980 video cards, unlike the version of nvlfash that we’ve had to use for DOS for the GTX 750 modification. 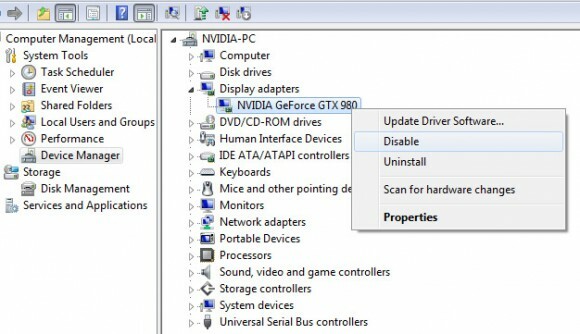 Now you can use a modified windows version of nvflash for easier saving and flashing of the video BIOS without worrying about getting a certificate error, the only thing you need to do before saving or flashing the video BIOS from windows is to first disable the video card driver from Device Manger. The easiest way to figure ut what values you need to modify to increase the TDP limit of your particular GPU is to use a tool such as MSI Afterburner or EVGA Precision X for example that gives you a slider to increase the Power Target limit. 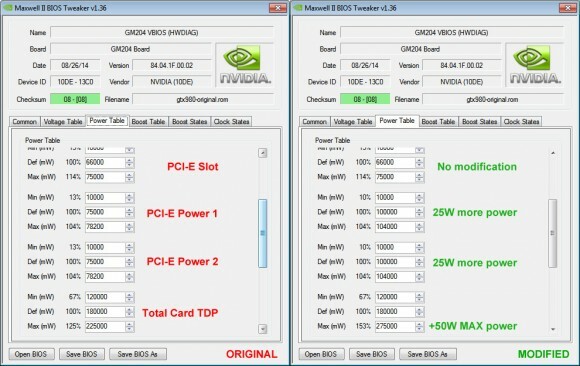 You need to note what is the maximum value in percent available for your BIOS and then look for the field with that Max value in the Power Table panel of the Maxwell II BIOS Tweaker tool. This will show you the total card TDP value, the one you need to increase, but not the only value you will most likely have to increase. In our case the 100% (standard) TDP limit of a GTX 980 GPU is set at 180W with a maximum user selectable value of 225W, however there is a bit of a catch here. The top three fields above the total TDP value are respectively for the PCI-E slot power (66W by default) and the first and second PCI-E power connectors on the card (75W each). You cannot modify just the total TDP value and not also increase the separate power lines maximum as if you do not the BIOS will still limit the power that the video card uses to the combined maximum of the PCI-E slot and the two additional PCI-E power connectors. So if we want to increase the total maximum TDP of the video card to 275W (+153%) as the maximum user selectable as in the example above, then we would also need to increase the first and the second PCI-E standard power limits by adding 25W more to each and this way we would be able to get to the desired maximum set for the card total TDP. We are not modifying the 100% value of the total TDP to 275W, but instead leave the default 180W TDP value there, so that we can increase the maximum (Max value) with Afterburner or Precision X if we need to, but if we don’t the card will still have the standard 180W TDP limit. Do note that in order for the increase of the maximum TDP level to have some effect on performance you would also need to overclock the video card by increasing the GPU and video memory frequencies. As we have mentioned with a good cooling (even the stock one can do just fine with increased fan speeds) you should be able to reach a maximum boost frequency of 1500 MHz or even higher with most GTX 970 and GTX 980 cards. In fact you might be able to hit such high OC frequency even without increasing the TDP level, however if you start hitting the standard TDP level of the video card the boost frequency will drop down. In order to be able to high the maximum stable boost frequency of the video card and keep the card working at it you will have to increase the TDP level, so that the GPU will have enough headroom. Do note that not all crypto mining algorithms will utilize the maximum available TDP level, so for some of them increasing the TDP level may not be required at all.